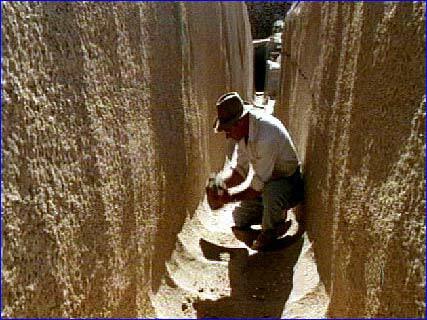 Archeologist Mark Lehner, a key member of nova expedition, crouches in a granite trench that abuts one side of the Unfinished Obelisk. 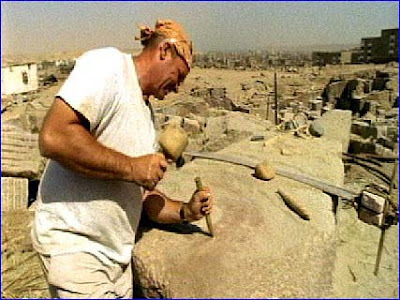 Lehner holds a piece of dolerite similar to the kind that he and others believe Egyptian quarrymen used to pound out the trench around the edges of the obelisk. They then lifted the pulverized granite dust out of the trenches with baskets. Evidence also exists that workers pounded underneath the obelisk until the monument rested on a thin spine. Lehner says that huge levers were probably used to snap the obelisk from its spine, freeing it so it could be carved more finely and transported. 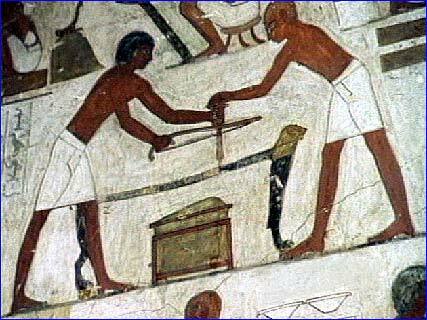 Archeologists know that the ancient Egyptians had the skills to forge bronze and copper tools. Stonemason Roger Hopkins takes up a copper chisel, which works well when carving sandstone and limestone rock, to see if it might carve granite. "We're losing a lot of metal and very little stone is falling off," observes Hopkins, which is hardly the desired result. Hopkins' simple experiment makes this much clear: The Egyptians needed better tools than soft bronze and copper chisels to carve granite. 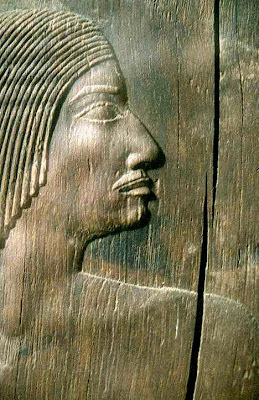 As a young man, Denys Stocks was obsessed with the Egyptians. For the past 20 years, this ancient-tools specialist has been recreating tools the Egyptians might have used. He believes Egyptians were able to cut and carve granite by adding a dash of one of Egypt's most common materials: sand. "We're going to put sand inside the groove and we're going to put the saw on top of the sand," Stocks says. "Then we're going to let the sand do the cutting." 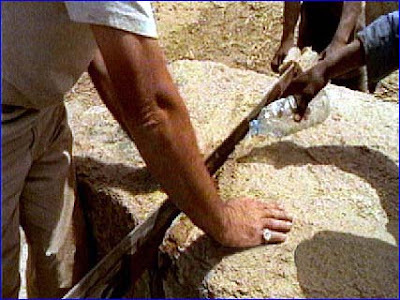 Hopkins' experience working with stone leads him to believe that one more ingredient, even more basic than sand, will improve the efficiency of the granite cutting: water. Water, Hopkins argues, will wash away dust that acts as a buffer to the sand, slowing the progress. Adding water, though, makes it harder to pull the copper saw back and forth. While Hopkins is convinced water improves the speed of work, Stocks' measurements show that the rate of cutting is the same whether water is used or not. Besides cutting clean surfaces on their granite, the Egyptians also drilled cylindrical holes into their stones. 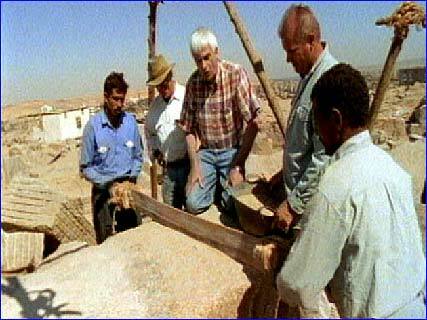 A hole eight inches in diameter was found drilled in a granite block at the Temple of Karnak. "Even with modern tools—stone chisels and diamond wheels—we would have a tough time doing such fine work in granite," says Hopkins. Stocks was brought along to test his theories about how the cores were drilled. Inspired by a bow drill seen in an ancient Egyptian wall painting, Stocks designs a home-made bow drill. 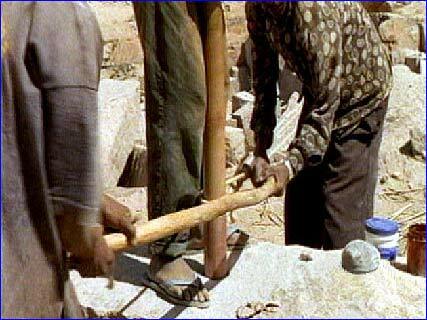 He wraps rope around a copper pipe that the Egyptians could have forged. Hopkins and Lehner then pull back and forth on the bow, which is weighted from above. 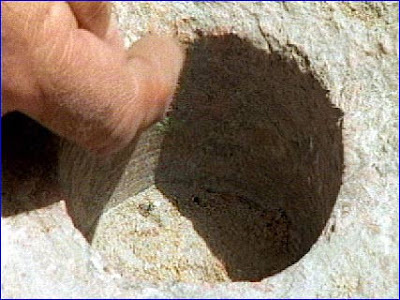 The pipe spins in place, rubbing the sand, which etches a circle into the stone. 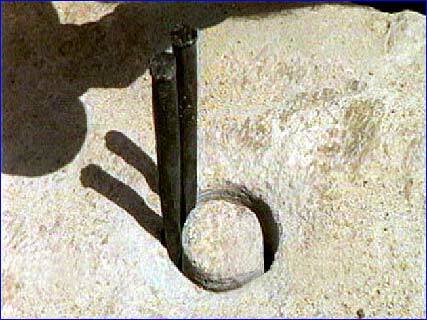 With the assistance of the sand, the turning copper pipe succeeds in cutting a hole into the granite slab. With the aid of a bow drill and sand, the pipe has cut a circular hole into the stone. But how can the drillers get the central core out? This is 100% plagerised from PBS/NOVA. When I was at Aswan in 1985 I had begun a collection of rocks from unusual and historic sites - as cheap but extremely fascinating souvenirs. Naturally there was a piece of the pink granite at Aswan. I'd read somewhere that dolerite was imported from upstream Nubia in order to cut the granite. I reasoned that there had to be some lying around. I soon found a lump of dark rock, totally unlike the granite. It was so clearly "allochthonous" that it looked kind of lonely. I decided that this was the dolerite from upstream, quarried there and transported by ancient man to Aswan. What it was actually used for and how it was used are good questions, but it had to have been there for some good reason. so there you go. These were some of the first specimens I collected. 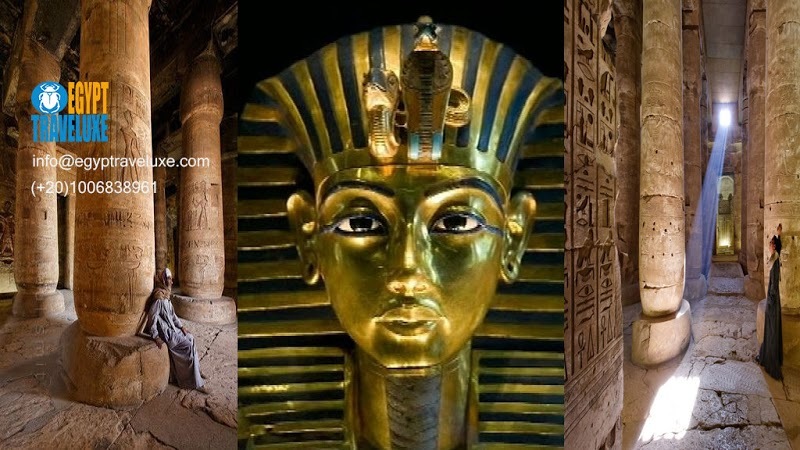 Did you know what happens in Abu Simbel temple twice a year?